How to commission a painting of your pet. All you need is to provide a clear, sharp photo. You can send photos via e-mail, CD, or hard copy which I can scan and return. Send as high a resolution as possible. I need to be able to see the eyes well. Send several if possible, but please indicate your “favorite” or which you think shows your pet’s personality best. After reviewing your photos, I will send to you a “preview” which will give you a sense of the planned painting for your final approval. $300 charge for each additional dog or cat. $250 for a full body portrait. Framing is available upon request for an additional charge. A 50% deposit is required and the balance paid upon completion of painting. Special backgrounds and additional elements subject to additional fees, as agreed upon by customer upon start of painting. 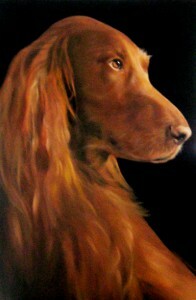 Multiple dogs or cats can be painted together on the same canvas for an additional charge. All paintings are finished with a clean painted edge ready to hang. Framing is available upon request for an additional charge. Credit card payments are accepted through PayPal, personal checks or money orders. If you have any other questions, please do not hesitate to e-mail or call. I look forward to hearing from you.